The 888 Sport football predictor rewards gives you a chance to win £5000 in free bets by guessing the result of 8 Premier League matches, if you place a qualifying bet. These are the best type of loyalty rewards as they give you extra chances to win for the things you would bet on anyway. To qualify all you need to do is place a £10+ bet on any sports market between the beginning of Thursday and the start of the first match in the Premier League predictor on the Saturday. There are no minimum odds or market restrictions attached. Once you have qualified for the game you will not be able to make your make your prediction via a pop-up that will take you to the prediction page. Next predict the result (win / draw / win) of the eight selected PL matches. If you get all 8 correct you will then win, or share if multiple correct guesses, £5000 in free bet tokens. If no one guesses all 8 correctly the prize will be given to the person(s) who guess 7 correct results, and so on, until the prize is awarded. Free tokens themselves are then given within 3 days, remain valid for 7 days and can be used on any sports markets with no minimum or maximum odds restriction. Of course as these are tokens the stake itself will not be given back but anything you win is paid out in cash. Full terms apply and can be read on the 888 sport site, you also need to be over 18 years old to play. 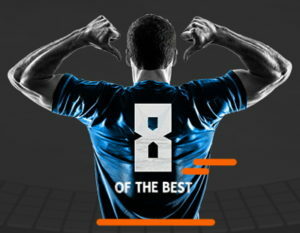 If you do not have an 888 account you can also claim their welcome offer, which you can read about in out full 888 Sport review. Note however you can’t use free bets to qualify for the predictor, this must be a real money wager.